A Palestinian terrorist took selfies on the Temple Mount before stabbing two young yeshiva students in the Old City of Jerusalem over the Sabbath on Saturday, leading to a foot chase during which he succeeded in stabbing a policeman and two young Torah students before being shot and killed. Prior to the attack, 17-year-old Ahmad Jazal, a Palestinian from the West Bank, visited the Temple Mount, a known rallying point for Arab terrorists, on Saturday afternoon (Muslims are allowed to ascend and pray freely at the site; Jews and Christians are not). He took photos of himself in front of the Dome of the Rock which he then posted to his Twitter account. He then descended into the city and began his attack on Hagai Street around 3:30 in the afternoon. He first attacked two young ultra-Orthodox yeshiva students, or Torah scholars, who were walking through the cobblestone alleyways of the Old City in the quiet Shabbat afternoon. The terrorist stabbed both young men, aged 18 and 20, and then fled the scene. Jazal was immediately pursued by IDF Border Policemen, who chased him into a nearby building, where he stabbed one of the policemen before they shot and killed him. The three Israelis were lightly to moderately injured. After the attack, the selfies posted by the terrorist were shared by Palestinians on social media, with many praising his actions and calling him a martyr. Martyring oneself in the name of the Temple Mount is a common Palestinian terror theme. Arabs claim the Temple Mount, where the two Jewish Temples stood over 2,000 years ago, as a purely Muslim site – a position absurdly reinforced by a number of United Nations resolutions passed in recent months. These resolutions, the work of UN’s cultural and educational arm, UNESCO, essentially deny all historical and religious connection between the Temple Mount, which is Judaism’s holiest site, and the Jewish people and religion. Captured by a false narrative that the state of Israel is attempting to take the Temple Mount back from Arab control, and strengthened by the support of pro-Palestinian UNESCO, Palestinian and Israeli Arab terrorists have used the Temple Mount over and over to justify the killing and maiming of innocent Jews, Israelis and tourists. In that context, the implication of Jazal’s post is unmistakable: with his act of terror, he intended to “matyr” himself to “protect” the Temple Mount, which is actually already in the hands of a Muslim Jordanian Waqf. 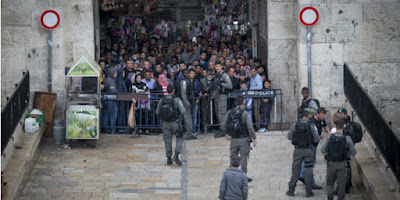 Following the Sabbath attack, police closed the gates into the Old City. 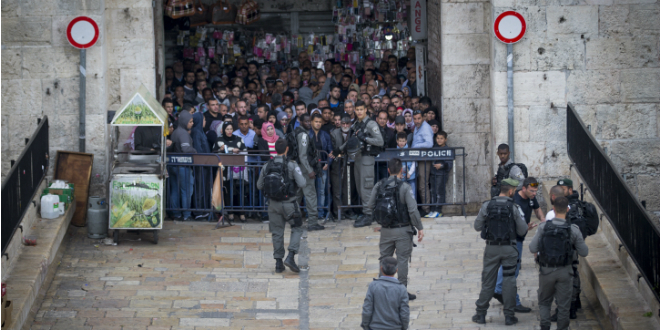 Palestinians responded by rioting at the Damascus Gate, throwing stones and firebombs at police. The police used teargas to disperse the crowds. This was the second attempted stabbing attack in one week in Jerusalem.